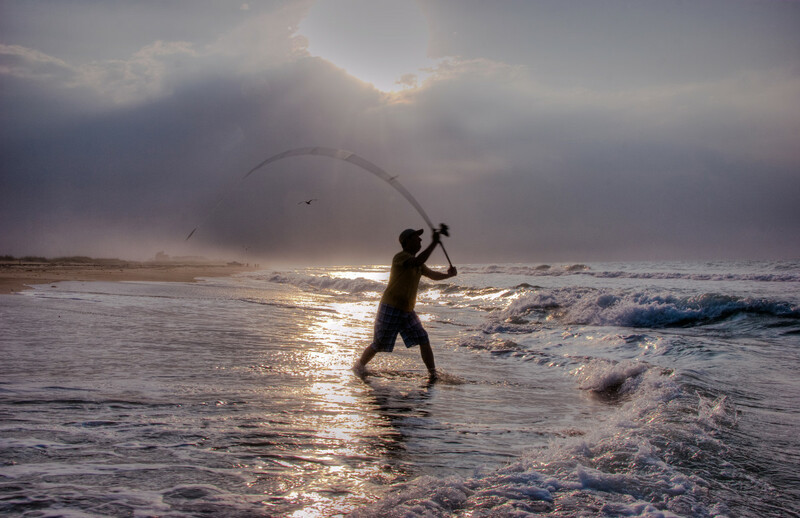 Surf fishing is primarily a salt water sport that involves casting a bait or lure into the surf while either standing on the shoreline (sandy or rocky beaches, rock jetties, or fishing piers) or physically wading out into the water. In most cases, the objective is to cast as far out into the water as required to reach the fish, which at times may be at considerable distances. To overcome some of these factors and get that extra casting distance, an angler could try using waders, using longer fishing poles, using a kayak, or using a drone. Each one of these methods for extra casting distance have their own benefits and limitations; however, kayaking the bait or flying the bait with a drone provides the longest distance from shore. This article will focus on surf casting (and fishing) using a drone. The reader will be guided through all of the steps including equipment required, initial rigging, casting, benefits, risks, and applicable laws and regulations. For those not interested in surf fishing, or fishing at all, inspiration to repurpose the drone (lake fishing, dropping water balloons, delivering items, etc.) using similar methods described through the article could be found. Keep reading on! To drone fish, one needs a drone and accessories. 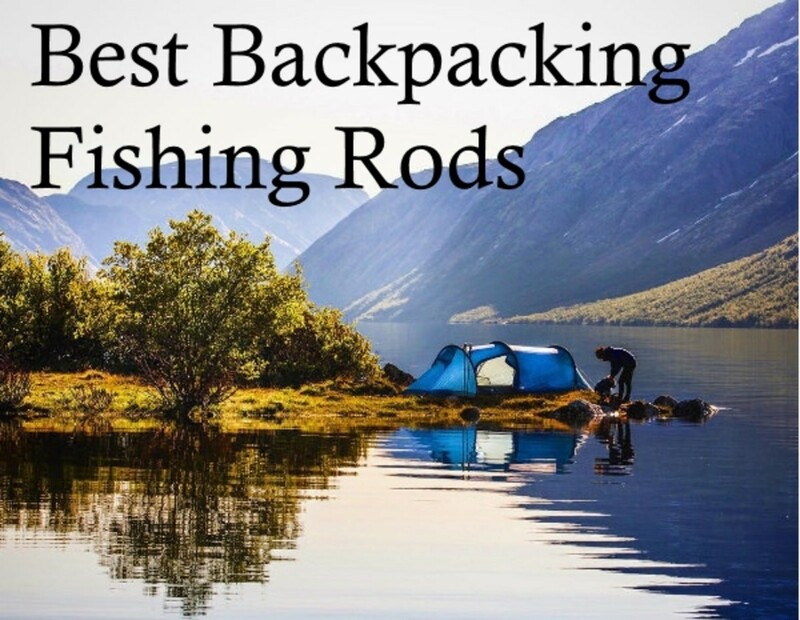 It assumed that an angler will already have appropriate fishing gear, so items such as rods, reels, and tackle will not be discussed here or in the article. Some of the most important equipment required to drone cast and fish are listed below, and a cost break down of an example drone fishing package (the author's own package) is provided at the end of the article. Drone and controller: To repeat the start of this section, "To done fish, one needs a drone". There are many drones on the market to choose from of varying cost, features, and benefits; and it is important to select a drone suitable for casting. 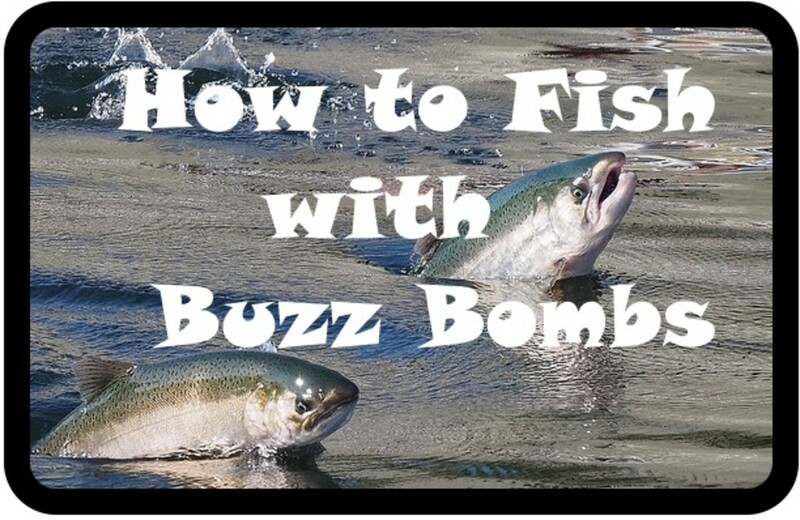 Surf fishing will require flying tackle, baits (sometimes live) or lures a good distance from the shoreline; and in many cases, there is a strong wind coming in from the water. Drones for this purpose will need to handle potentially windy conditions and have good payload capacity, so a mini drone that fits in the palm of your hand will not work. Information on selecting a drone for surf fishing is in the next section below. Phone/tablet: Most people do not leave home without a phone or tablet anyways; but unfortunately for those that like to leave one at home while fishing, most drones require a phone/tablet running an App in conjunction with the controller for flight. There are a few drones that will operate with an independent controller without an App, so choose a drone that best suits personal needs. Spare batteries: Battery life of a drone depends on many factors including drone type, payload (tackle plus bait plus "x" feet of line weight), camera usage, and weather conditions. Utilizing a single battery could lead to a short or frustrating day of drone casting into the surf unless your normal fishing gear includes a power inverter or generator (even then, it takes a couple hours to fully recharge a drone battery). The author typically gets between 10-15 drone casts out into the surf per battery. Downrigger releases: Once the bait is flown out some distance from shore, it then requires to be dropped from the drone into the water. There are several drop mechanisms available, and there are even dedicated fishing drones (see Selecting a Drone section) now with remote drop built in. However, downrigger releases are readily available at tackle shops, reliable, and inexpensive (4/$8.99). The downriggers work on tension to where an overpull (ie. continuing to fly forward with line slack removed) will release the bait from the drone. The tension setting is adjustable so that it can be set dependent on the payload to be cast out. Technically with a downrigger, a drone could be used to jig or troll, and any fish bite would release the line from the drone for the angler to then reel in with the rod and reel. Mini screw driver: Miniature screw drivers are handy to have around, and if using downrigger tension releases, they will be used to adjust the tension settings as different tackles and baits are drone casted out into the surf. Spare propellers: There are a few ways in which the drone's propellers can become damaged and/or warped. Spare propellers are inexpensive, and many drones will come with a couple spares as part of a package deal. Good propellers are critical for balanced flight, especially when carrying the payloads involved with drone casting. Accidents do occur, and without spares, it could be a short day casting with the drone. Once, the author was not paying close attention and had high winds create havoc on takeoff. The line ended up in the rotors, the steel leader was cut in half, the propeller was nicked up, and the drone flipped upside down. The drone would not fly correctly after with the damaged propeller but was fine after it was replaced with a spare. See Risks section further in the article for more information. Signal boosters: Signal boosters are not all that necessary for drone casting as most drones have more than adequate distance range for flying out baits or lures from shore. They are available at a reasonable cost to where they can be changed out with the factory antenna on the drone's remote control, and they might be useful in areas of high population density with a high number of transmitting devices that could decrease a drone's flight range. Another factor to consider with signal boosters is that your drone may have too much range, with Federal Aviation Administration (FAA) requirement for hobbyists to fly a drone within visual site (See Important US Laws and Regulations section). 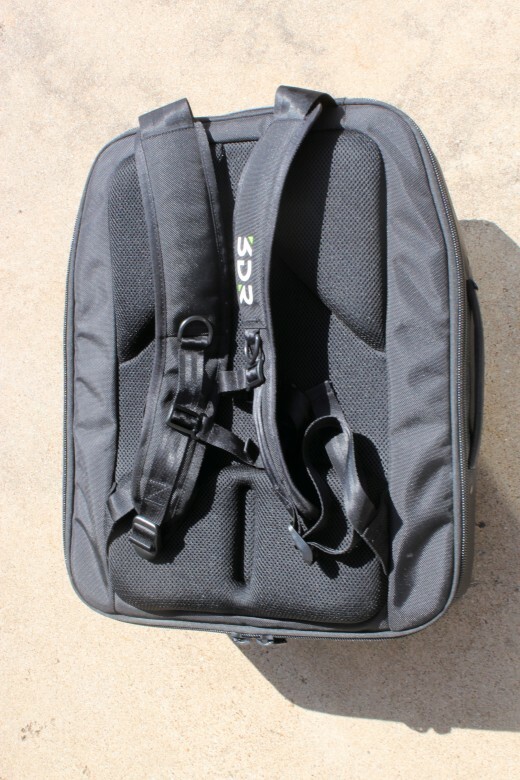 Carrying case/backpack: The drone and all accessories sounds like it could be a lot of equipment; however, it can all fit in special carrying cases or back packs. 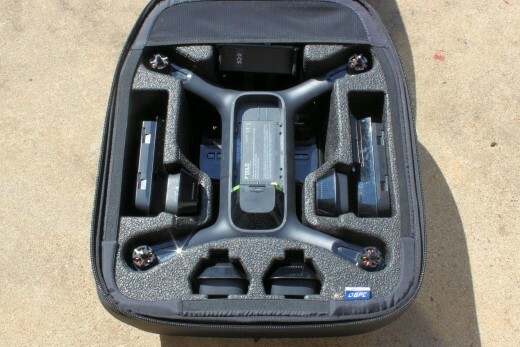 These cases are very convenient in making the drone casting package highly portable. The portability benefit is especially useful when fishing gear needs to be transported on foot some distance from a designated parking area. An example of a complete package for drone casting (including all equipment in this section less the signal boosters) is shown in the image below. This package is the author's personal drone casting kit. There are many drones out on the market now, and this article presents eight good (if not the best) choices of drones for casting or fishing applications. DJI is a market leader in personal drones, and this is evident with 3 of the drones on this list being theirs. The author of this article strongly considered a DJI drone for his personal drone fishing package; however, after much deliberation, decided on a 3DR Solo drone. There are many drone comparison websites out there, so evaluate each drone's specifications, pros, and cons to find the best fit for the desired applications prior to purchasing. 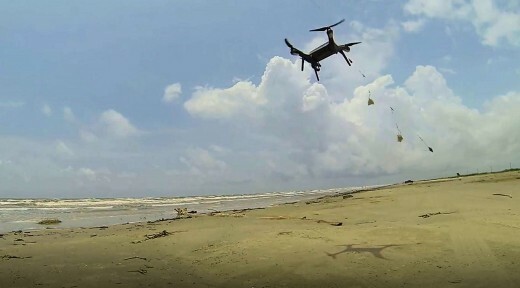 There are not that many drones that come with a bait or item dropping/release system, so it is likely that your drone will require some initial rigging prior to taking it out to the surf. First, it needs to be decided what release mechanism or method will be used. This article will focus on the downrigger release as described in the Equipment Required section due to its simplicity, reliability, and low cost. Downrigger releases are readily available and can be purchased from tackle shops, sporting good stores, or online. 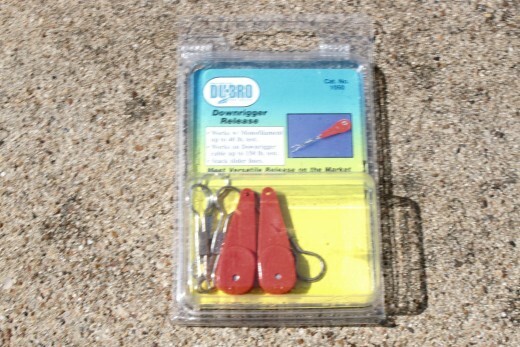 The article author tried Dubro downrigger releases (see photo below) from the local tackle shop, and found them so effective he didn't try any others. After you get a downrigger release device, it needs to be attached to the drone. 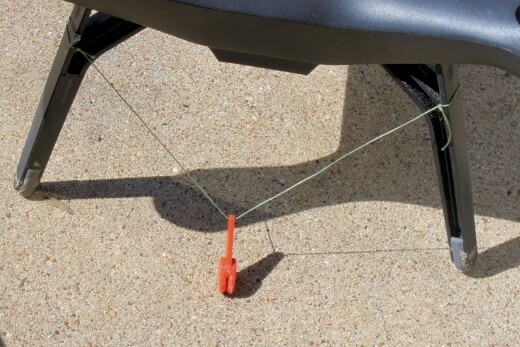 Attaching it to the drone requires a line (braided fishing line works well) strung through the release and between the landing legs. 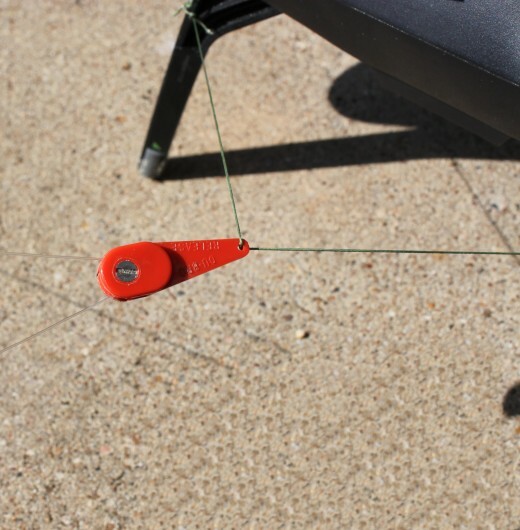 Simply attach (tie) one end of the line to a landing leg, then thread it through the downrigger's eye, and then finally tie off onto an opposing landing leg. 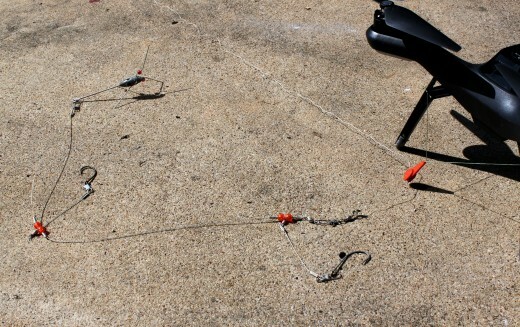 The author tied the release to the drone's two back landing legs and has not had any issues; however, he recommends that the release be attached at the center of an "X" at the bottom center of the drone by tying off to all four landing legs. This will provide a balanced distribution of the payload under the drone during flight. Make good knots and use a line of good strength. If not, the entire system could come off when trying to release, due to untying or line breakage. The final downrigger release installation between the drone's back two landing legs can be seen in the photo below. The article author created an instructional video on rigging his drone with the downrigger release, and it can be seen below. Once the drone is rigged up to carry and drop a payload (line, tackle, and bait), it is time to hit the surf to start drone casting. This section explains how to use the drone to cast (with installed downrigger release) upon arrival to the desired fishing spot. Working under a hovering drone is not the safest of options for both personal and asset safety/risk. 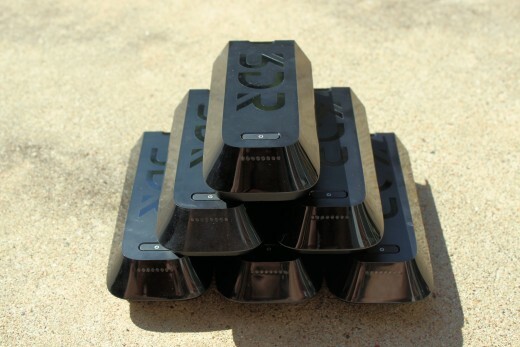 Why waste precious battery life and reduce the number of available casts per battery when there is no need. First thing is to have the desired fishing rod in a rod holder with the drone on the ground nearby. Bait (or use favorite lure) the rod. Open the reel bail - note this is for a spinning reel. Other fishing reels will need to be able to freely spool out line accordingly. Take the baited tackle over to the drone and snap the fishing line (just above the tackle) into the downrigger release. 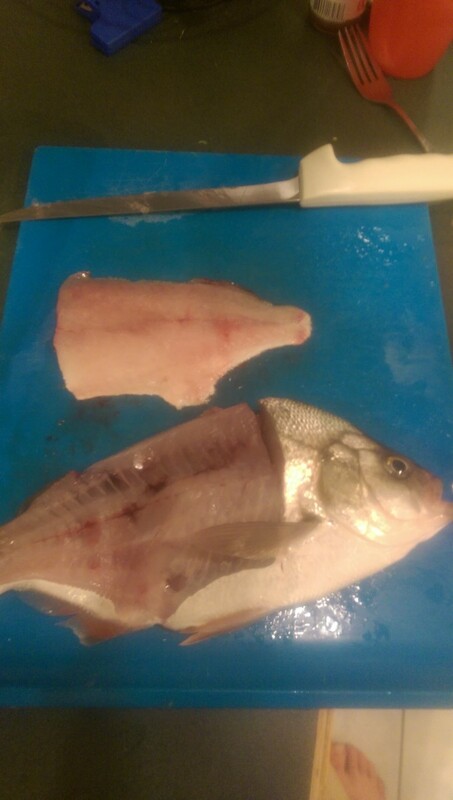 See the image below for an example (example is non-baited tackle). Perform a tension check and adjust the tension accordingly. The image below is an example tension check; note the screw visible on the downrigger as turning it clock or counter clock wise tightens/loosens the tension setting. 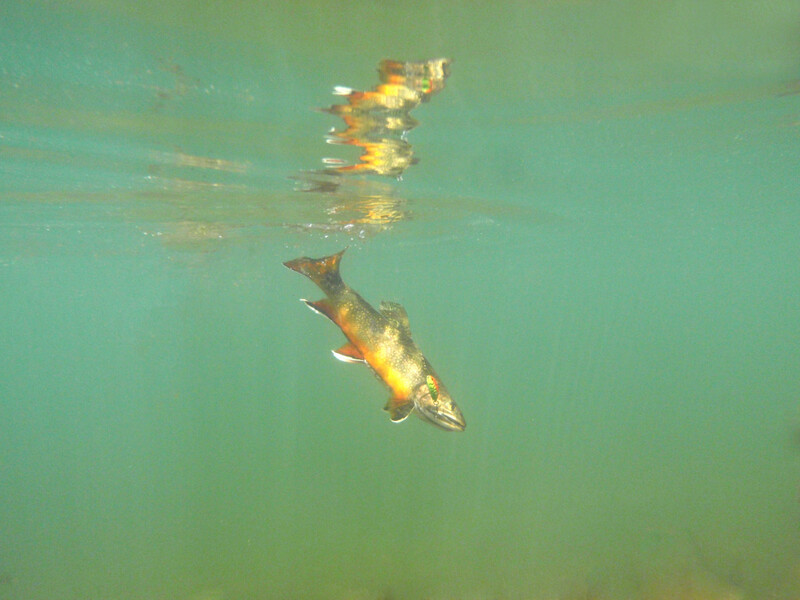 The fishing line should firmly snap in and out of the downrigger release device; however, if set too firmly there is a risk of not being able to drop the bait in flight. Too light of a tension setting and the bait will drop upon take-off. Once the fishing line is snapped into the downrigger, pull on the line and if line comes out too easily, then use mini screw driver to tighten tension. If the line is too firm in the downrigger, use the mini screw driver to loosen the tension. A safe way to adjust tension is to have a light tension setting and take off with drone. Upon take off the bait will fall from the downrigger from the lift forces. Adjust tension slightly higher and repeat until the payload does not release from takeoff lift forces. If using the same rod-payload combination for each cast, then tension setting will be good in subsequent casts. Over time, the angler will get a good feel of tension settings and will be able to quickly adjust based upon the pull test. When the drone is ready for take-off, fly drone to desired fishing location. When ready to drop the payload, close the bail on the reel; and fly the drone forward. The force of the drone moving forward while the line is fixed provides the tension over pull required to drop the payload from the downrigger release. After the payload is released, hit the "Return to Home" feature (if available on drone) and start reeling any excess fishing line slack. The drone will automatically return to its point of takeoff using GPS as the angler manages their rod and reel. Power off drone and place it out of the way. 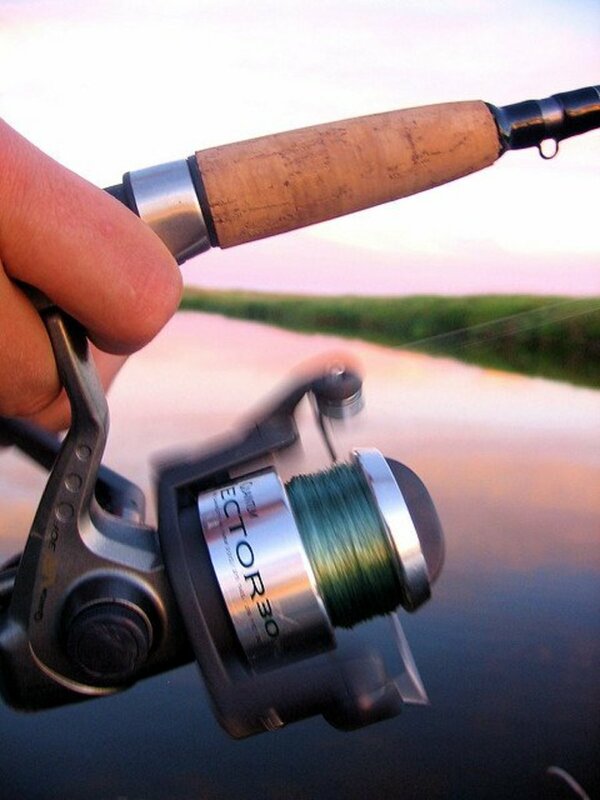 Ensure the fishing reel has a sufficient amount of line or is tied off to the reel at the end. If not and drone is flown at a distance further than line length, then the drone will fly forward and have potentially 100s of feet of loose line attached to it. This could create big problems trying to get the drone safely back to shore. A video of the author demonstrating drone casting as discussed in this section can be seen below. Besides the traditional methods an angler might use to find the fish, a drone can offer up a few technological advantages as well. The drone's camera can be used by the angler for reconnaissance to scout the waters prior to flying out actual bait. Potential spots can be noted by the drone's distance from shore or GPS location to where bait can be dropped on a later flight. Trial and error through test casts at 100 ft increments is another easy method with a drone. The angler will have exact flight distances provided by the drone software, that experimentation can be done with a variety of baits at different distances (say 100-ft increments). Once a hot-spot is found, the drone can consistently fly back to that same location every time. Longest distance casting out into the surf requires usage of either a kayak or a drone; and a full, new drone package required for surf casting is very similar in costs to a cheap fishing kayak package. With costs between the two packages nearly identical, why choose a drone over a kayak for surf casting? A drone can fly out and over the water in any surf condition, where a kayak will have its limitations. Round trip dropping of bait into the water is FAST with a drone compared to Kayaking out and back with drones able to fly more than 3o+mph. No need for a truck and/or trailer to transport the drone package to desired fishing spot. The entire drone package fits in a backpack which easily fits in any vehicle. Easy to transport and move from fishing spot to fishing spot once the angler's vehicle is parked. It is not exactly an easy task to strap a kayak to one's back and walk freely around. How do you like to fish? If money were no object, what would be your preferred fishing method? Drone casting, fishing, or usage is not without risks. It is important to operate a drone in the safest manner possible to not only protect the hard-earned money spent on it, but also to avoid personal injury, property damage, or fines. This section highlights a few risks associated with drone casting, and by no means is all inclusive. Drawing attention to yourself: Drone casting is not yet an everyday occurrence and so others find it interesting and fun to watch. Drone casting may bring crowds which like to watch and ask many questions. These crowds may include law enforcement and game wardens. 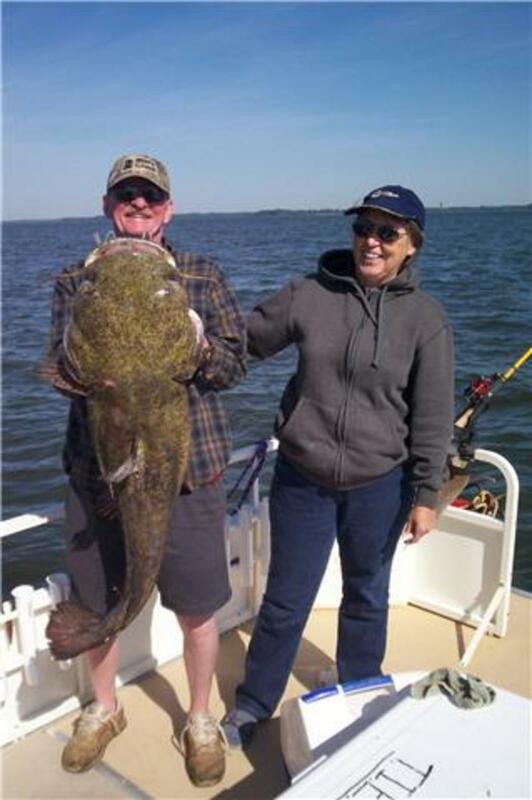 As such, it is important to know the basic regulations listed in this article as well as local fishing regulations. The author has had the opportunity to speak to many law enforcement officers and game wardens while drone casting, and all times were fine and warning free, Officers and wardens are just as excited to see the drones in action as everyone else, and several wardens have offered up fishing spots that would be great for the drone to reach. Release device attached incorrectly: A drone can be damaged or lost forever if the release device is installed incorrectly. An example is in the picture below where there is too much line slack where the release is tied between the drone's landing legs. In this scenario, it is possible for the line and release to pop up above the rotors after releasing the payload. If this happens, it is possible to get tangled and drop the drone out into open waters. This is a small risk as most likely the rotors will just slice the line. Too much weight: Drones have good payload capacity and can handle many tackle and bait set-ups; however, flying with excessive weight or payload will affect the drone's flight performance and capabilities. Non-release/drop: It is possible that the payload is not dropped as planned, for example if a downrigger release tension is set too high. If this happens, it can be precarious getting the drone safely back to shore. The author has had this happen once in extremely windy conditions and was able to reel in the fishing line while slowly flying the drone backwards back into shore. Weather conditions: High winds, rain, lightning, and other weather events can cause damage or loss of a drone. Most drones are not water proof, and many cannot fly in winds >25 mph. Of course, no one should be fishing in lightning anyways. Line length: Ensure the fishing reel has a sufficient amount of line or is tied off to the reel at the end. If not and drone is flown at a distance further than line length, then the drone will fly forward and have potentially 100s of feet of loose line attached to it. This could create big problems trying to get the drone safely back to shore. Several governing bodies may impact the legality of drone fishing in your area, and it is important to always stay informed on enacted or pending regulations and laws. On a Federal level, the Federal Aviation Administration (FAA) governs Unmanned Aircraft Systems (UAS); and there may be additional state/local rules and regulations on UAS. Also, the Department of Wildlife, Fish, and Game will have their regulations, including fishing license requirements. Drone fishing normally falls under the FAA rules of flying for hobby or recreation, so pilots can operate under the Special Rule for Model Aircraft. As soon as a pilot starts to monetize their drone fishing in ways such as charging to admission to watch drone cast, offering to fly out and drop other's bait for a fee, or selling flight recon (video over fishing spots), then a whole new set of FAA rules would apply including pilot tests. Angler drone pilots also need to register their drones. This is because the FAA requires drones greater than 0.55 lbs (250 grams) and less than 55 lbs (25 kg) be registered online for a $5 fee for a 3-year registration. A drone less than 0.55 lbs (250 grams) does not require registration; however, a drone this small will be of no use to a drone angler due to lack of payload capacity for the bait plus line weights. Drones greater than 55 lbs (25kg) require paper registration and cannot fly under the FAA rules of hobby or recreation flight, so will not be a desirable choice for drone casting. After registering the drone, a pilot will receive a registration number that must be inscribed on the drone (writing on the drone body with a Sharpie is sufficient). A drone angler may have multiple drones under the same registration number; however, may only have one of those drones in the air at a single time (each drone in the air at a given time must have its own unique registration number). Fly for hobby or recreation ONLY. Fly within visual line of site. Fly a drone less than 55 lbs (25 kgs) in weight. Notify the airport or air traffic control tower prior to flying within 5 miles of an airport or heliport (land or water based). Fly at altitudes less than 400 ft (122 m). Report all incidents to FAA within 10 days if results in serious injury or loss of consciousness of a person or causes any property damage in excess of $500 (other than the drone). Adherence to the rules are of utmost importance. 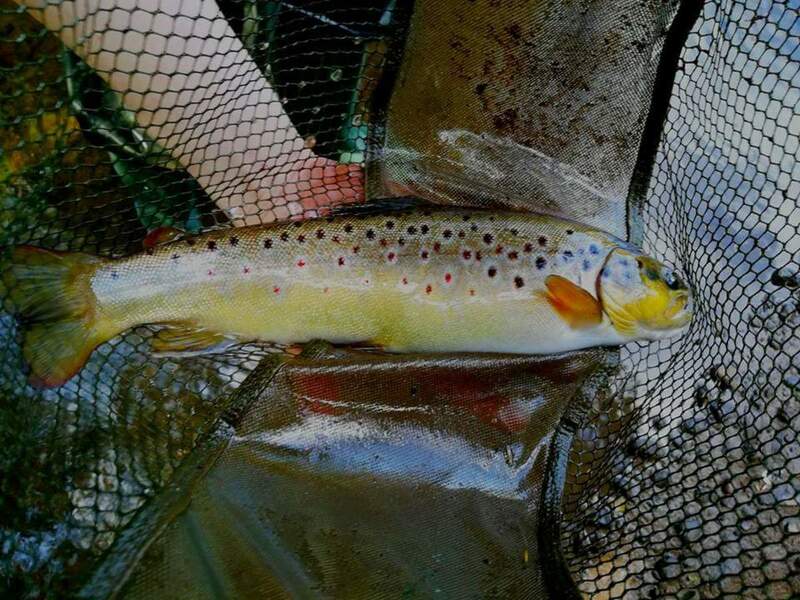 Not only in terms of being a responsible angler and model citizen; but also, violations of FAA or any governing/applicable laws and regulations can result in fines, time in prison, or a combination of both. Earlier in the article it was stated that a package required for drone surf casting is comparable to what a kayak package would be. To demonstrate this, an example new and used price breakdown of a drone surf casting package is given in the table below. This example is of items found in the author's personal package. Prices are conservative as extensive research to find the lowest possible prices was not performed. A complete new drone casting package costs $1030.99 where a used package runs $471.99. An example new and used price breakdown of a drone surf casting package. This example is of items found in the author's personal package. Prices are conservative as extensive research to find the lowest possible prices was not performed.